BART in South Bay Area is becoming a reality. Within weeks of opening the Warm Springs Station in Fremont, BART offered a tour to Valley Transportation Authority union staff and member leaders. VTA is partnering with BART on South Bay public transit projects. 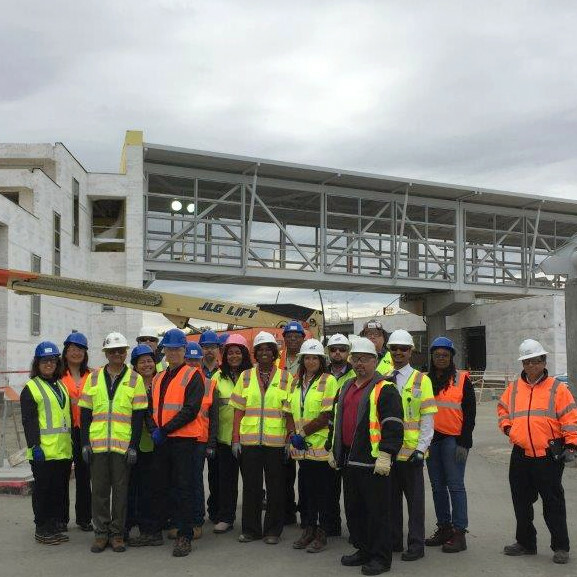 The group of about 20 viewed the new BART station in Milpitas and construction sites. Check out this month's South Bay News. It’s one of those conveniences we use several times a day. Flushing a toilet. Rinsing food from dishes. Washing our hands. But few ever think about where that water goes. When you’re cleaning 100 million gallons of sewage water every day, you need several people monitoring the complex system of flow. Help Local 21 Feature Our Members! Late February, as thousands of South Bay residents evacuated neighborhoods during heavy rain and flooding, Local 21 members prepared for the storm, kept the region updated, sheltered those affected, and repaired communities afterward. Local 21’s newest chapter, the Cupertino Employees' Association (CEA), is quickly proving itself to be a rising star. Before joining Local 21, CEA’s previous contract had the lowest cost-of-living increases (COLA) amongst all of its neighboring South Bay cities and the some of the worst health coverage for families in the area. After six months of negotiations, the Local 21/ CEA bargaining team won wage increases and big reductions to healthcare premium costs. TAEA Members recently voted nearly 80% yes on a new MOU; and the VTA Board of Directors already approved. The proposed three-year deal features 3.5%, 4%, 3% wage increases for the hardworking employees at the Santa Clara Valley Transportation Authority. On May 10, San José City Council voted 10-1 to comply with the court order removing all Measure B language from the City Charter and Municipal Code and rescinding the resolution that placed Measure B on the ballot in 2012. Only Councilmember Pierluigi Oliverio voted to violate the court order. Measure B, passed by voters in June 2012, called for Draconian cuts to City workers’ retirement benefits. In approving a recently negotiated settlement to San Jose's illegal Measure B, City Councilman Ash Kalra exclaimed, "San Jose's long civic nightmare is over." In tweaking a famous quote from former President Gerald Ford, Kalra summed up labor's years-long fight with the City of San Jose over worker benefits. Since pension-cutting Measure B's passage in June 2012, City employee unions and the city have been sparring in superior court and at the state’s Public Employment Relations Board.